Sheldon comes to us from Myrtle Beach SC. 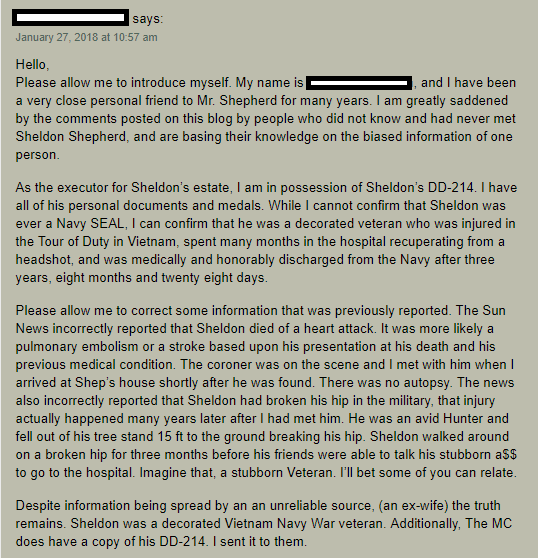 A news article written about him was noticed by a SEAL combat veteran so he asked us to look into it. 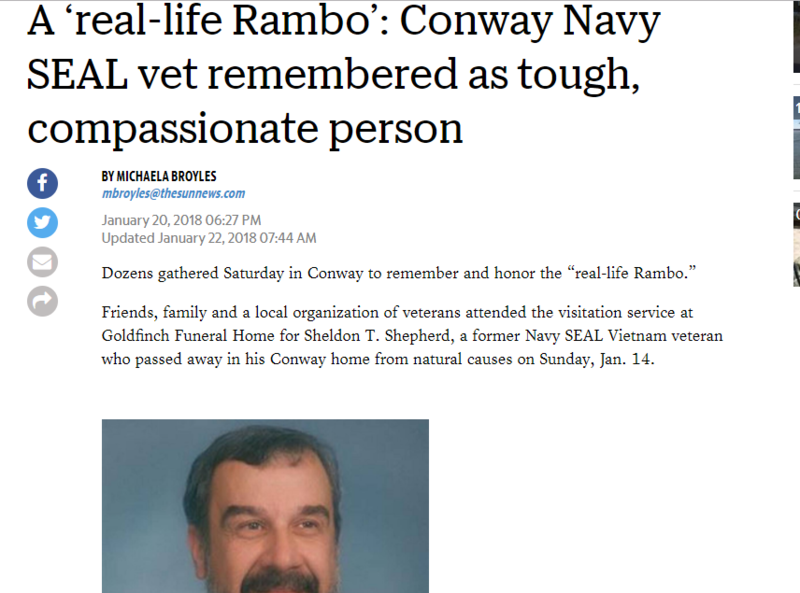 The obituary lists combat action as a Navy SEAL in Vietnam and receiving two Bronze Stars for valor and a Purple Heart. The news story also adds he was shot multiple times and still has a bullet lodged in his neck. It also states he specialized in diving and explosive mechanics. His shadow box was displayed at his service showing the the Vietnamese Gallantry Cross is in the box. Its awarded for accomplishing deeds of valor or displaying heroic conduct while fighting the enemy. The Purple Heart is also displayed. As an investigator I contacted some of the people who set up the memorial and a reporter that wrote one of the articles. The individual with the motorcycle association told me the DD214 provided shows the medals claimed and dive courses. He did not send me a copy of the DD214. 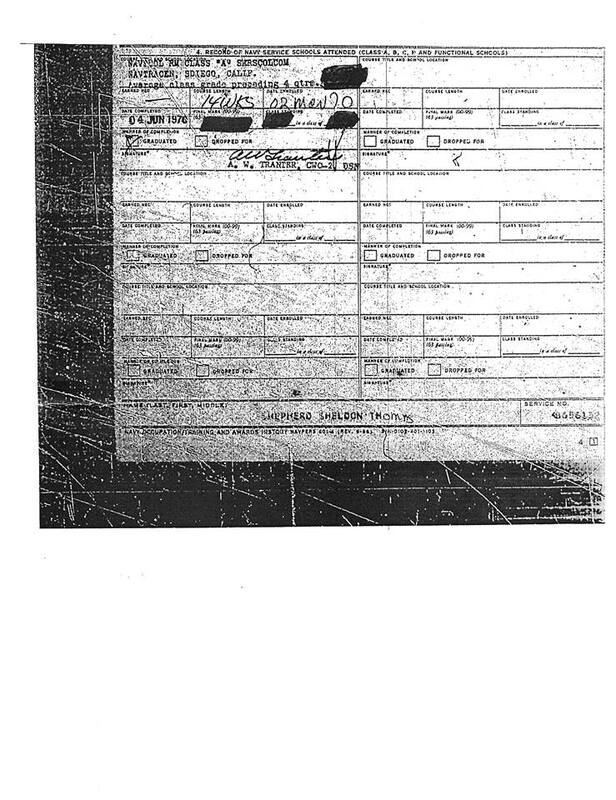 The reporter told me she saw the paperwork with the claims but did not keep a copy. 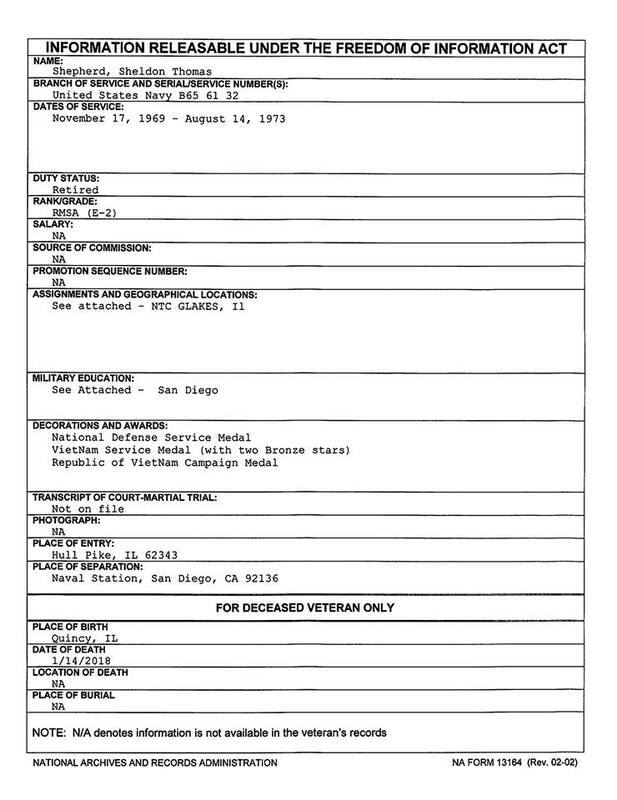 The reporter caught a lot of flak for the story so lets all remember that they are not experts in military documentation and go with what’s presented. 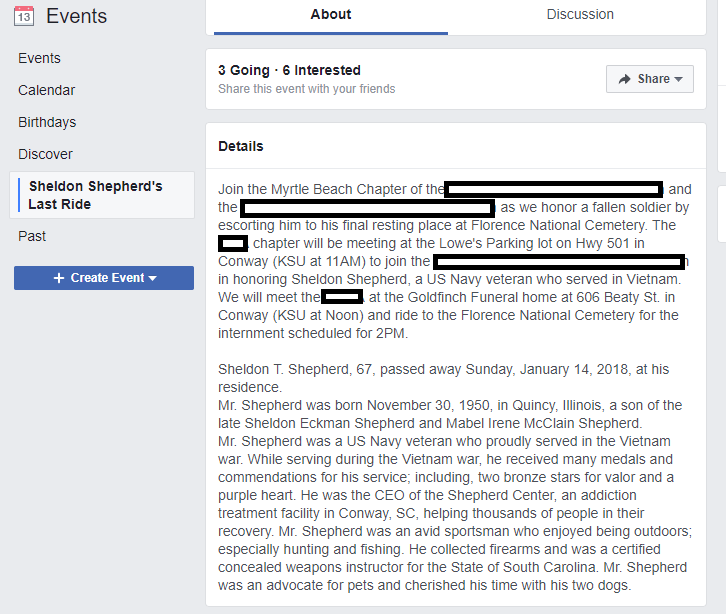 Even after being informed by investigators that Sheldon was not a Navy SEAL It seems he will be honoured Friday as a Navy SEAL combat veteran with the awards that are claimed. 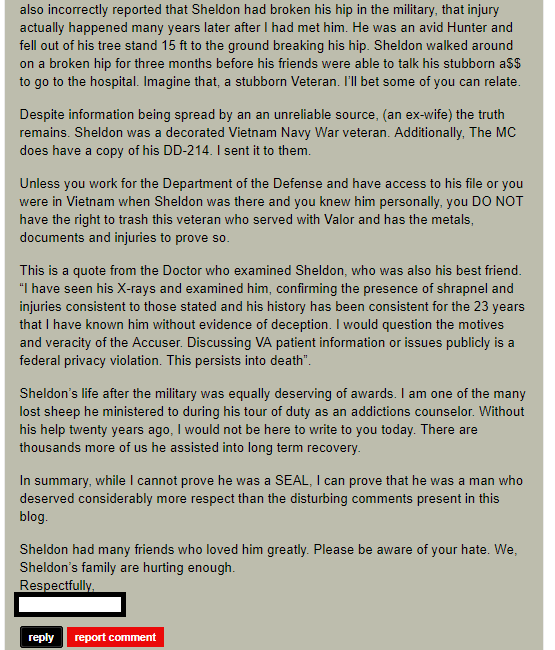 A post from our partners at This Ain’t Hell has the claimed executor of Sheldon’s estate stating that she is in possession of paperwork showing that he was a wounded combat Veteran and that he was “head shot”. 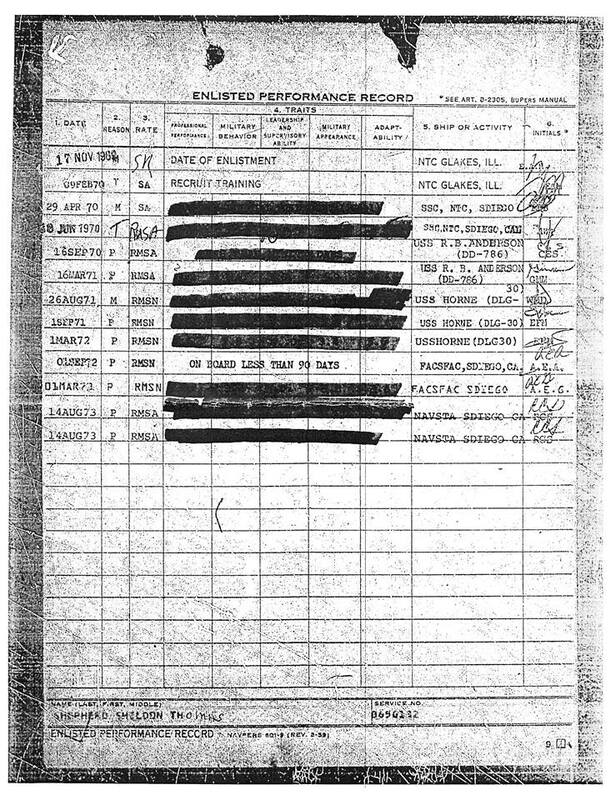 We ordered his records with a Freedom of Information Request and are presented here. Mr. Shepard served in the United States Navy from 1969 to 1973. He got out at a rank lower than it was in 1971. 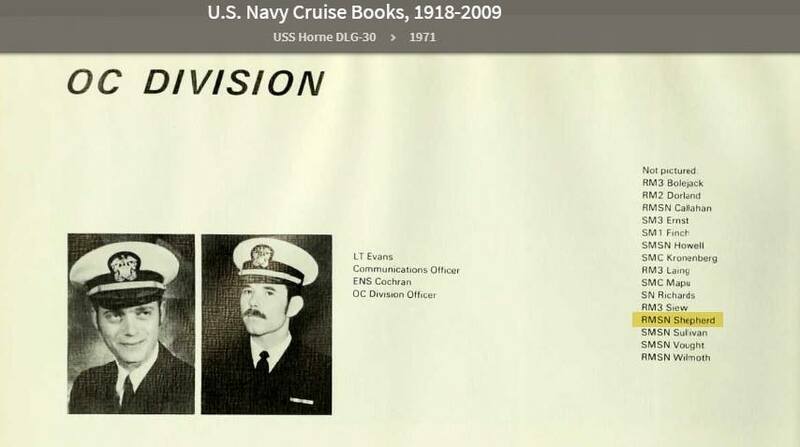 During his four years he served on two ships. 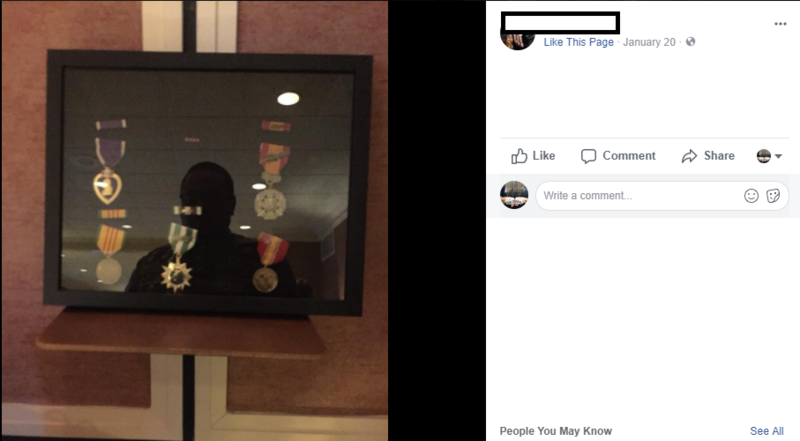 He received the National Defense Medal, Vietnam Service Medal with two bronze stars (often in records people see this as Two Bronze Star Medals, they stand for different campaigns (operations) that his ship was involved in while they were stationed off of the coast of RVN), Republic of Vietnam Campaign Medal. He received those medals while aboard his ship off the coast of Vietnam. What is not listed is a Purple Heart, Bronze Star Medals for Valor, Combat Action Ribbon, Vietnam Gallantry Cross with Palm, or any schools associated with SEAL Teams, explosives or diving. The only school listed is Radioman A School. 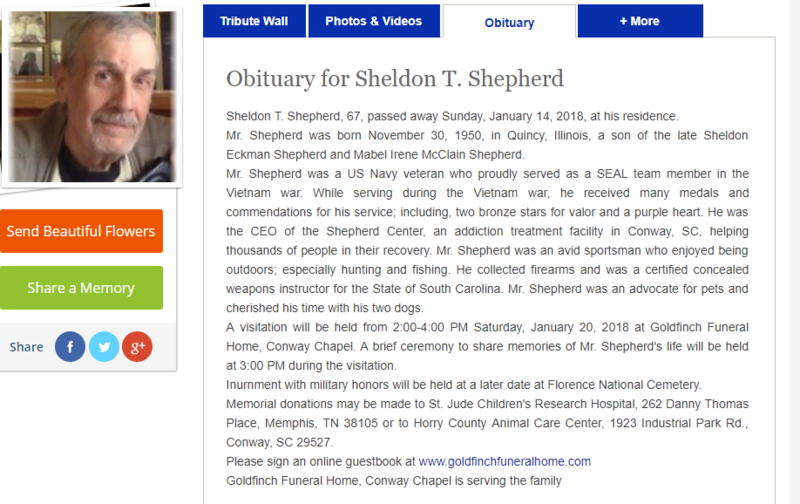 Sheldon T Shepard is a Vietnam Veteran. All the other claims are not true. While I am sorry for your loss, he is not the hero he pretended to be. 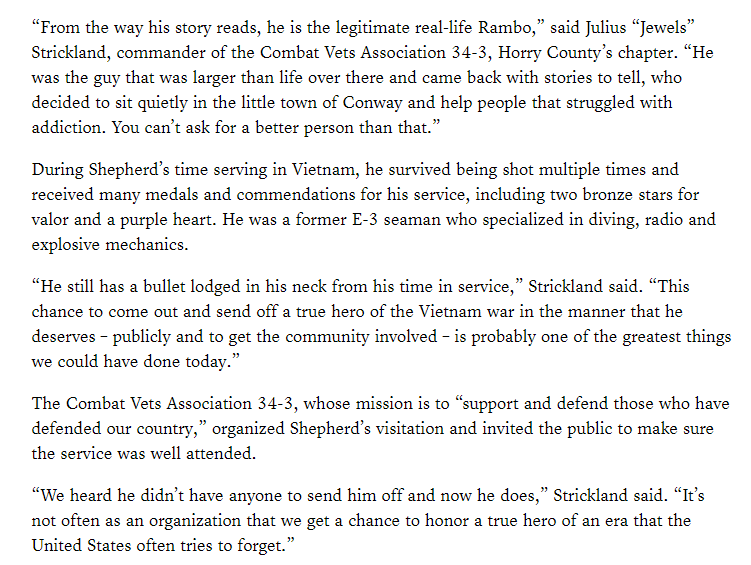 He was not wounded in combat and does not have the Purple Heart. I know how painful the truth can be, I also have a brother who has continued to lie about his service for many years. He is still living and stands by his false claims for many years, even though, we have exposed him and printed his real record that contains no medals, no wounds, nothing. The only injury he ever received was from a drunken driving accident while he was stationed in Germany. 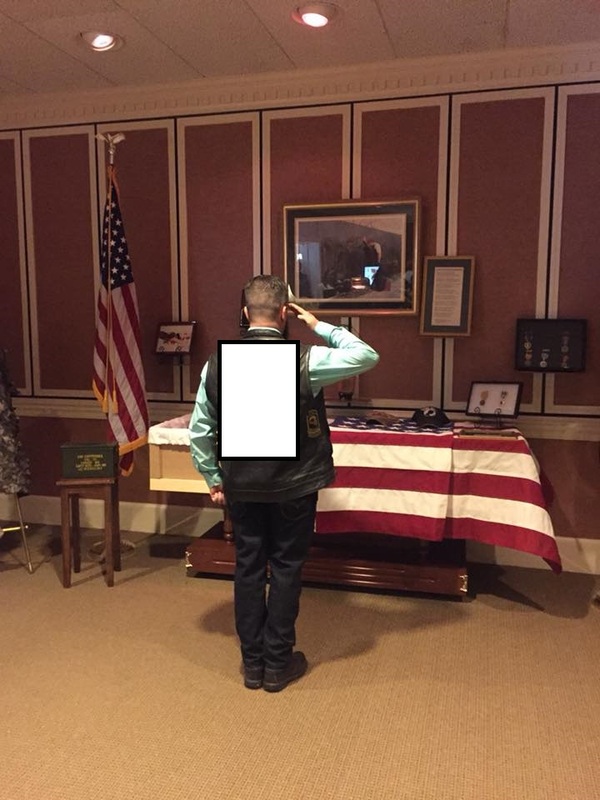 My brother has scammed the VA out of hundreds of thousands of dollars with his false records. I know how painful the truth can be, but please don’t glorify an obvious liar. Just accept the truth and move on with your life. 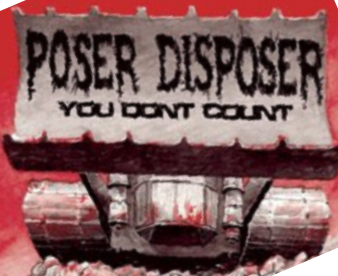 It is very easy to falsify a DD214, the only one you can trust is the original one from the NPRC. Again, I am very sorry for your loss, you should be proud that he served during a time when most would not. May he rest in peace. Once again ty tango mike for another job well !!! !